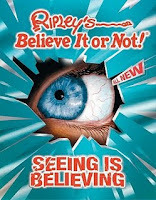 Ripley's Believe It Or Not: Seeing is Believing (Ripley Publishing, August 2009), which is going straight on my library's shelves. We don't have many of these types of titles and I know my kids are going to love it. And How Beautiful the Ordinary: Twelve Stories of Identity (HarperTeen, October 2009), an ARC that Becky picked out for me. With stories by David Levithan, Jennifer Finney Boylan (have you read She's Not There: A Life in Two Genders? I loved it! ), I'm sure this is one I'm gonna love. Happy reading, everyone! What was in YOUR mailbox this week? They both sound like great books! Congrats on winning your books. Have a great day! yay - it came quick! I sent it Tuesday afternoon. Glad you enjoyed it. "How Beautiful the Ordinary" looks really good and I hadn't heard of it before! Interesting books you got this week. They all look pretty good. Hope you enjoy reading all your books. How Beautiful the Ordinary looks terrific -- I am looking forward to your review.